That "x" in Felixstowe tells you that this is one angular town. We've had previous pontification on the scalene Triangle. Being beside the tangent of the prom-prom-prom makes you acutely aware of the perpendicular normal of The Pier. Criss-crossing streets cause a volume of vertices, meaning it ain't hard to find a cafe on the corner. There's the righteous River Of Life, super Sangha and outstanding Oaks. 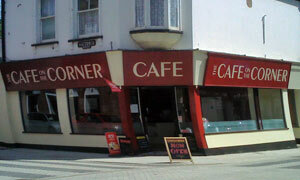 Bottom of South Hill sees The Conservatory square up to the aptly named Corner House Cafe: wonder what they'll think to the geometrically monikered Cafe On The Corner? On such a glorious day, the sunnier spots nearer the door are spoken for; no matter, it's the cheap seats for us. Those old-fashioned dark red menus are as Felixstowe as Charlie Mannings (RIP). Driver and passender both opt for all-day breakfast variants -- nowt too fancy here -- and place our orders at the counter. Might be a bit of a wait, says the man: busy today. Not surprised given the mightily reasonable prices. Like the original kiddies' artwork on the wall. My sausage, egg and chips combo, embellished by proper branded condiments (Herr Heinz and Senor Sarsons), is well worth the none-too-protracted wait. Milkshake is more than acceptable too. Glancing up, my heart skips a slight beat when I see the nice lady from Kev's poker club. Clear that all the best people and finest cardsharps come here. Wasn't very gentlemanly of me to remind her that I'd knocked her out with a pocket pair. Of 2s, natch. Laden with carbs, there'll be no pudd, just a filter coffee. Man heads over to our table: sorry, it'll be 10 mins wait for a fresh pot. Ah: straight coffee is fine, thanks. Sixty seconds later, waitress appears with my mug and 10p change. I take a sip. Should have hung on for the good stuff. Never mind: top value, central location and decent grub. If you're looking out for it, you can't miss it -- it's the one on the corner. If it was a car -- Citroen Berlingo Multispace. If they were passing by -- Victoria Coren.